Fotios S, Uttley J, Fox S. A whole-year approach showing that ambient light level influences walking and cycling. Lighting Research and Technology. First posted online 24/11/2017. doi.org/10.1177/1477153517738306. Fotios S, Qasem H, Cheal C, Uttley J. A pilot study of road lighting, cycle lighting and obstacle detection. Lighting Research and Technology 2017; 49(5): 586-602. Uttley J, Fotios S. Using the daylight savings clock change to show ambient light conditions significantly influence active travel. Journal of Environmental Psychology, 2017; 53; 1-10. Fotios S, Castleton HF. Lighting for cycling in the UK – A Review. Lighting Research and Technology, 2017; 49(3); 381-395. Fotios S, Bohm A. Road lighting and accidents: Cyclists, lighting, accidents and responsibility. Lighting Journal, 2017; 82(5); 28-32. While road lighting guidance alleges consideration of cyclists, there is very little empirical evidence of lighting for cyclists available to inform such guidance. Bespoke guidance for cycle tracks is very much out of date. We are aiming to provide some evidence, and equally importantly, promote consideration of cyclists in the research community and in the design of lighting. Cyclists have two visual needs of lighting: to see, and to be seen. To meet these needs there are two sources of lighting: road lighting and cycle mounted lighting. For cyclists there are a wide range of lamps to choose from. Do more lumens provide better lighting (which seems to be a common inference of marketing)? Not if the higher lumens cause higher glare for other road users. And does it matter whether the forward lamp is fixed to the handlebars or the safety helmet? For the road lighting engineer, how should cyclists’ needs be incorporated alongside those of the pedestrian, the driver, the resident and the budget holder? What we need to find out is how road and cycle lighting might work together to satisfy cyclists visual needs. We aim to address questions regarding the optimum level (luminance) and spectrum of road lighting and the level (vertical height and luminance) of cycle mounted lights. For cyclists, we then need to find a path to encouraging use of good lighting after dark. Policy: A review of policy in the UK for cycling concluded that while the UK government seeks to increase the frequency of cycling, there is insufficient attention given to the infrastructure that might encourage such behaviour [Fotios and Castleton, 2015]. Cyclists are a vulnerable road user, and accident statistics suggest cyclists are right to be concerned about their safety. This work is ongoing in collaboration with Dr Alexandra Bohm (Lincoln School of Law). Obstacle detection. We carried out a detection test to investigate how changes in road lighting and cycle mounted lighting contribute to the detection of road surface obstacles in the road ahead. [Fotios, Qasem, Cheal, Uttley, 2016]. 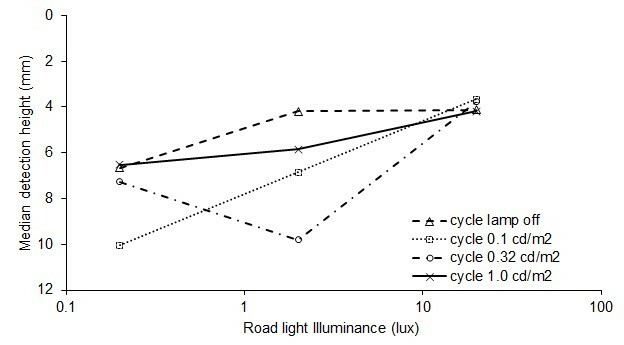 This produced two interesting conclusions: (1) the use of both cycle lighting and road lighting is not always beneficial, as contrast reversal can reduce the effectiveness of both – see Figure 1; (2) a cycle-mounted lamp is more effective when located at the vertical height of the wheel hub than on the handlebars or helmet. For these trials we built a novel dynamic fixation marker (Figure 2) to simulate the visual behaviour of natural cycling, and during tests participants were seated on a cycle to simulate the body position and cognitive load of pedalling (Figure 3). Figure 1. Results of the 1st experiment, with a handlebar mounted lamp either switched off or providing a target luminance of 0.1 to 1.0 cd/m2. Switching on this lamp led either to reduced detection performance or had no effect compared with road lighting alone. Figure 2. 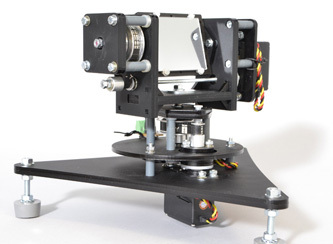 Mirror on robotic gimbal constructed to provide a dynamic fixation point. Figure 3. 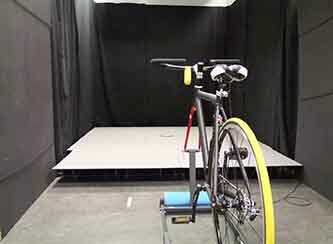 Experimental apparatus for measuring obstacle detection whilst cycling. Ongoing work. Cyclists visual attention has been recorded using mobile eye tracking. Those data are currently being analysed. We used a dual task and measured involuntary physiological responses to guide identification of visual fixations at critical moments. We are also working with Antal Haans (Eindhoven Technical University) and Maurice Donners (Philips Lighting) to carry out a field trial of obstacle detection.